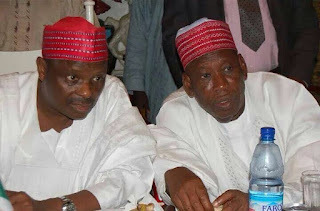 The Transition Committee set up by Kano State Governor- elect, Abdullahi Umar Ganduje Thursday, said that the outgoing governor, Rabi’u Kwankwaso has not only left an empty treasury but additional liability of N379 billion. Abubakar, a professor of Food Nutrition gave the break down of liability by the Kwankwaso’s administration adding that the total capital receipt to the state between May 2011 and May 2015 stood at N 419.75 billion out of which N430.6 billion was spent. He further said total capital receipt by the 44 local government areas of the state within the same period stood at N346.591 billion which was expended on joint projects between the state government and the local governments. Abubakar who served Kwankwaso as Commissioner for Finance between 1999-2003 explained that the outgoing administration initiated over 4,000 projects, for which over N140 billion was paid to contractors with N4.5billion still outstanding.